SourceMedia is a digital marketing company based in New York City. Accounting Today, which is a publication managed by SourceMedia, routinely produces webinars that are approved for CPE accreditation. SourceMedia is also an Internal Revenue Service designated Approved Continuing Education Provider, and on occasion provides additional IRS based certification for webinars. SourceMedia has utilized SimpleCert as their Certificate Management System since 2016. 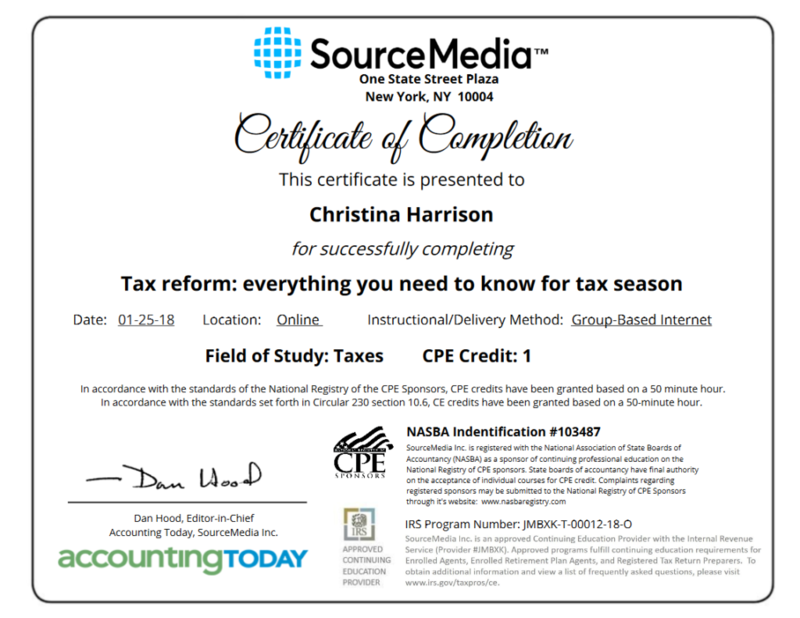 Being an IRS Approved Continuing Education Provider requires that SourceMedia utilize a different certificate for webinars that have the higher, IRS approved level of CPE certification. SourceMedia accomplishes this by utilizing two Certificate Templates within their account: one for standard CPE certification, and the other for IRS CPE certification. IRS CPE certification rules require that each certificate display the “IRS Approved Continuing Education Provider” logo, as well as a Program Number that is unique for each approved webinar course. SourceMedia automatically adds this Program Number as a merge field on their Certificate Template, so that it’s a part of their recipient upload list – and thus is automatically placed on each recipient’s certificate.